Underwater acoustics (!) for this ocean-themed fine dining well-known for it’s gourmet seafood .. An experience of a lifetime! 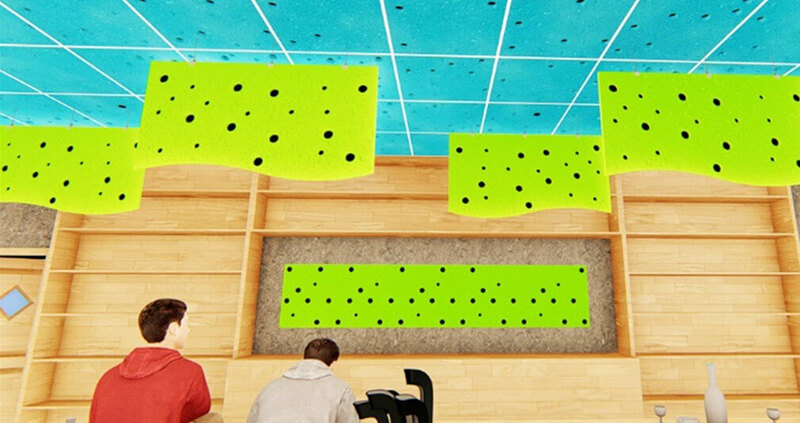 Digital fabric stretched around windows and switch plates with adjacency printing on differently sized wall panels spaced apart on blue walls. 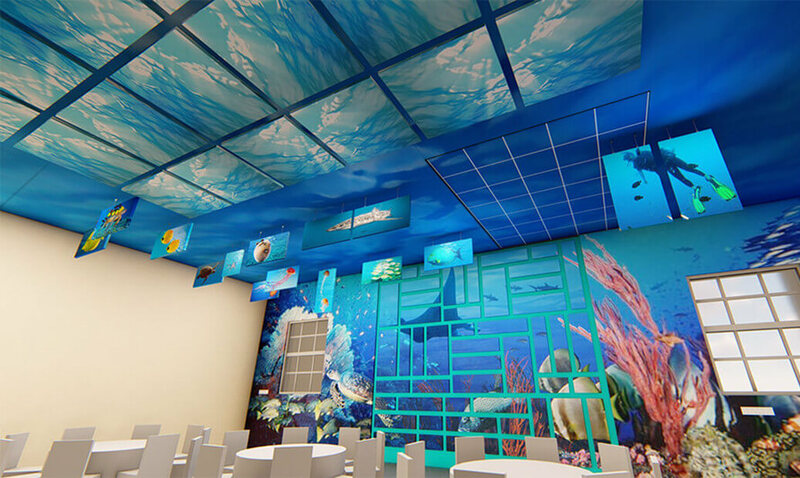 Ceiling boasts stretched fabrics with accessibility for plenum utilities via grid ceiling tiles and clouds that sparkle the sun from underwater whereas fishes and scuba divers roam freely on baffles! It cannot get more 3D than this! 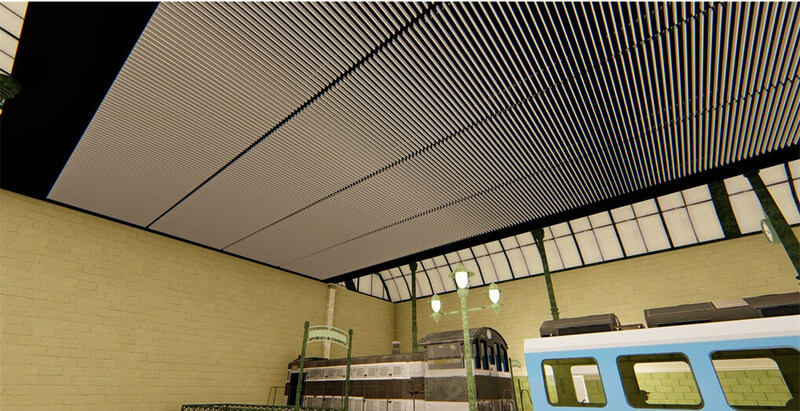 Mat Perfs wall panels, Mat Perfs ceiling tiles and Mat Duo Shapes Perfs baffles all in Circulo25|50 pattern combine to create a unique ambience for this golf pro shop. Circulo matches the golf balls. Serge Lance straddles this industrial building to provide a ultra modern ambience and protection like a knight in shining armour! It’s mixed up! It’s messed up! It’s meshed up! It’s mashed up! 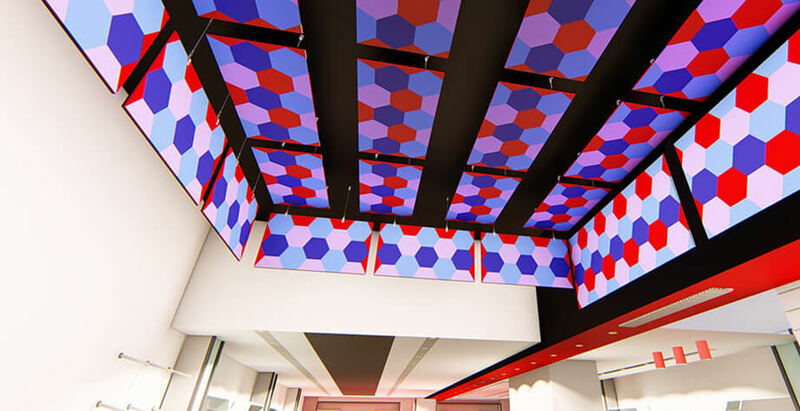 Visual acoustics for an upmarket gym in a star hotel. Synth Slim Mozaic is random Synth Slim Shapes on Strand Primer with Stick S7. On the wall as panelling and as acoustical baffles | clouds suspended from the true ceiling. What a concept! Hey presto! On the wall as panelling and as acoustical baffles | clouds suspended from the true ceiling, Synth Slim Appliques concept for a toy shop in a shopping mall. 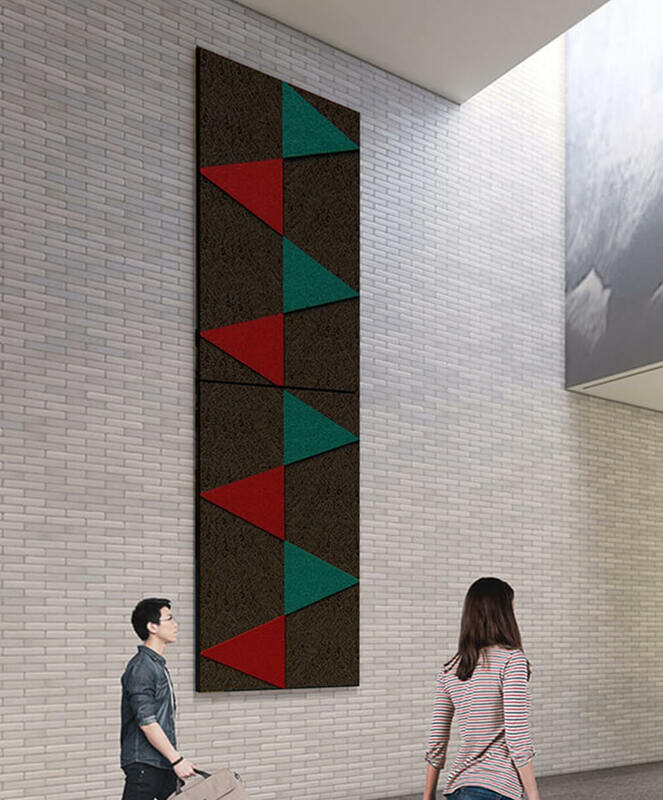 Directional panelling that provides visual cues for movement at the double height corridor of a modern arts gallery & museum. Soundz in April is an internal event of Team Anutone. SoundzPW and other Soundz events are open to eligible ecosystem at other times of the year but on invitation. Actual availability of the featured new products is minimum one quarter later viz July 2019 onwards. Samples and prices on request. Project images are 3D renders by architect for illustrative purposes and Anutone claims no association. Product colours, prints are indicative and may differ on actual panels due to blotting and fading. Product embossing, shapes are indicative and may differ on actual panels due to surface texture limitations. It is the responsibility of the user to conduct due diligence and assess the suitability of the products to projects. Copyright and Intellectual Property belongs to Anutone. No contents must be copied, scanned, reproduced, transmitted, stored, retrieved or otherwise used in any form without prior written permission of Anutone.